Peacekeeping operations are highly complex, with numerous UN bodies and member states holding different responsibilities, many of whom have resisted previous reform efforts aiming to ensure that peacekeeping operations can safely and effectively implement their mandates. Improving performance will require significant, high-level political engagement by numerous stakeholders across many areas of peacekeeping—which is exactly what the A4P initiative seeks to engender. A4P aims to mobilize partners and stakeholders, including member states, to strengthen peacekeeping. Member states are in the process of agreeing on efforts to which they will publicly commit as part of the A4P initiative. As part of the pillar on performance, they should focus on matching mission mandates with adequate uniformed, civilian, and financial capacity and giving the secretary-general the political support he needs to ensure better monitoring of mission effectiveness, increased accountability, and implementation of key management reforms. I outline below five critical reform efforts—already underway—that belong at the top of the performance pillar of A4P. Political space for change-agents within the UN Secretariat to work with member states to modernize policies, procedures, and standards aimed at improving the operational readiness of military and police units prior to deployment and the monitoring and evaluation of their in-mission performance. As Alexandra Novosseloff has highlighted, 80 percent of peacekeeping operation expenditures are military-related and many peacekeeping operations are directed to use robust force to implement their mandates. As highlighted in the recent report of Lieutenant General Carlos Alberto dos Santos Cruz, uniformed components are critical to ensuring the safety and security of UN personnel, premises, and assets. As such, it is important to sustain the high-level engagement of the past four years to strengthen the uniformed components of missions. However, the military and police are only one element of a multidimensional peacekeeping operation. 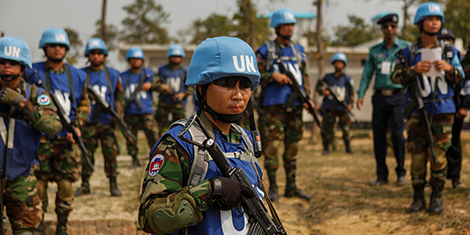 As set forth in the 2015 High-Level Independent Panel on Peace Operations (HIPPO) report and later echoed by member states, “Lasting peace is not achieved nor sustained by military and technical engagements, but through political solutions.” The political objectives of peacekeeping missions are largely pursued through the civilian components of a mission in close coordination with uniformed personnel, UN agencies and programs, and other bilateral and multilateral initiatives. The effective protection of civilians similarly hinges on a mission’s civilian component, integrated operations, and coordination with external stakeholders. While it is true that peacekeeping operations should “go back to basics” with more limited and sequenced sets of tasks, member states must also match the tasks given to peacekeeping operations with the requisite civilian capabilities. Among the decreases member states imposed on 2017 peacekeeping budgets, the cuts to the UN Stabilization Mission in the Democratic Republic of the Congo (MONUSCO), including its civilian air assets, ran counter to the mission’s efforts to be more agile and undertake integrated approaches to protecting civilians as violence escalates in the Democratic Republic of Congo (DRC). More effective and efficient civilian components will not result from budget cuts—management reforms are needed. For example, fulfilling a mission’s political and protection of civilian objectives depends on the timely recruitment of qualified civilian personnel, yet recruitment takes, on average, more than 270 days. Moreover, the selection of senior mission leaders is not transparent and still prone to prioritizing geographical representation over competencies. In addition to lacking adequate experience, these senior leaders receive little pre-deployment training or mentoring in the field. Last year, the secretary-general proposed comprehensive management reforms that include commitments to address these and many other human resource failings. Since 2017, the Security Council has increasingly included detailed language in its resolutions related to peacekeeping reform and renewals of mission mandates, including MONUSCO in the DRC, the UN Stabilization Mission in the Central African Republic (MINUSCA), and the UN Stabilization Mission in Mali. As importantly, this year’s report of the Special Committee on Peacekeeping Operations also included language requesting the Secretariat to develop, “an integrated performance policy framework for mandate implementation.” These welcome developments can push the Secretariat and peacekeeping operations toward a culture of monitoring, evaluation, and learning, which is fundamental to improved planning, budgeting, and impact. The HIPPO also focused on the need to “[empower] the field and strengthening the foundations,” in order to achieve “faster, more effective and more efficient” peace operations. Tackling this recommendation will require significant changes in the bureaucracy of the UN, particularly the Department of Field Support and the Department of Management. The current management dysfunctions within and between these two departments obstruct the UN’s ability to rapidly deploy peacekeeping operations to and within the field, undermining their fundamental purpose of preventing and interrupting escalations of conflict and violence against civilians. Secretary-General Guterres’ proposed management reforms aim to decentralize and align responsibilities and authorities and to update the UN’s regulatory framework. Unfortunately, some member states are prioritizing financial interests part of the status quo—e.g., procurement processes that benefit domestic suppliers—over the greater good of addressing inefficiencies. Others distrust the Secretariat’s ability to ensure financial accountability, and thus resist decentralizing and delegating budget authority to the field. Member states need to show strong support for these management reforms as they are likely to face strident resistance from Secretariat entities and personnel who fear the reforms will result in a significant loss of their power and resources. Since 2016, the UN has instigated four independent or special investigations: three into instances of failures to protect civilians, and one into an attack in the DRC that resulted in many peacekeeper casualties. While these investigative mechanisms are an important tool for the UN to identify and address mission-specific and system-wide weaknesses, their application remains ad hoc, lacking adequate guidance on what triggers an investigation, the use of a consistent methodology, and how findings, recommendations, action plans, and follow-up monitoring are shared with member states and the public. Recent pressure by Security Council members on the Secretariat to develop such guidance must be sustained if investigations are to result in immediate remedial action and address individual, mission, and system failures. On July 5, the UN General Assembly’s Administrative and Budgetary Committee (Fifth Committee) finally approved the annual peacekeeping budget—four days after the annual deadline. The delay was due in part to Russia and China seeking to cut important civilian posts and activities, including human rights personnel and programming, and to interfere with the Committee’s consideration of the secretary-general’s management reforms. The budget negotiations in the Fifth Committee demonstrate how member states can, and do, constrain efforts to improve peacekeeping performance. Like Secretary-General Kofi Annan’s 1997, 2005, and 2006 reform initiatives, Guterres’ management reforms and other ongoing efforts to improve performance could be scuttled by bullish unilateralism, strong ideological and political agendas, and financial pressure emanating from the United States, Russia, China, and other powerful member states. The A4P initiative gives member states the opportunity to build and sustain high-level political support to match mandates with capabilities and ensure priority management reforms are implemented. Alison Giffen is the Director of the Peacekeeping Program at the Center for Civilians in Conflict (CIVIC). How can the A4P strengthen peacekeeping?